Build your own summer retreat with this blue-striped beach house, featuring a cozy interior with a red armchair, fish tank and ceiling fan. Switch on the radio and take a swing in the hammock, do a spot of fishing from the balcony, take the water scooter for a spin, try an afternoon's surfing or just relax in the shade of the palm tree with the friendly sea turtle! When you feel like a change, rebuild the set to create a Beachside Shop or a Boatside Harbor. 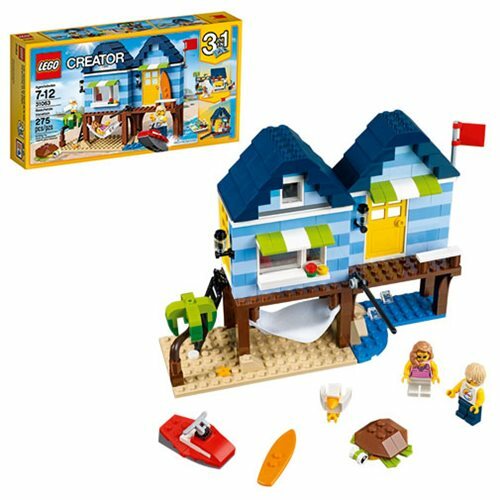 The LEGO Creator 31063 Beachside Vacation includes 275 pieces. Ages 7-12.